Reinhard Keiser’s formative musical training was in Leipzig, similar to the slightly younger cluster of Graupner, Fasch, Heinichen and Telemann. 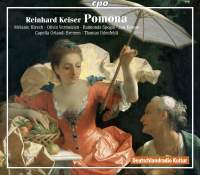 From the late 1690s Keiser had a long association with Hamburg’s Theater am Gänsemarkt, where the serenata Pomona (1702) was performed to celebrate the birthday of King Frederick IV of Denmark. Subtitled ‘Dispute of the Four Seasons’, the deities Flora, Ceres, Pomona, Vulcan and Bacchus dispute which of the four seasons is the best. The matter is settled by Jupiter, who proclaims in favour of autumn (championed by Pomona, goddess of fruit-bearing trees and gardens). Capella Orlandi Bremen’s single strings are few in number but play with finesse and engaging characterisation. Chittarone player Thomas Ihlenfeldt directs Keiser’s smoothly flowing sequences of short and snappy numbers immaculately (only two arias exceed four minutes’ duration). The continuo group play tastefully in many little arias where the attention is sagely devoted to the singer and the poetry, such as Flora’s intimate advocacy of spring accompanied by a lovely cello obbligato. Knut Schoch’s tender Zephyrus and Doerthe Maria Sandmann’s lightly tripping Flora sing a pleasantly summery duet that I suspect Handel recycled in an Italian cantata. Olivia Vermeulen’s refined singing in Ceres’s entrance aria has delightful passages accompanied by weightless violins without basso continuo. Jan Kobow’s melodic shaping and poetic delivery of words are well suited to Jaison’s sentimental expression of love for Ceres. The oboists produce lyrical colour in the Overture, a few brief dances and Bacchus’s merry song in praise of ‘the noble juice of the vine’ (sung with amiable wit by Raimonds Spogis). In the title-role, Melanie Hirsch has a series of blissfully sweet melodious arias, such as her moralising that childhood is like spring, youth like summer, but that only autumn is wise and fruitful (featuring poignant passages for two oboes and bassoon). Perhaps the artistic success of this might encourage more interest in reviving Keiser operas that Handel played in Hamburg, studied closely and borrowed from copiously.